Regent Seven Seas Cruises has completed its bow-to-stern upgrade of Seven Seas Voyager, giving the ship a luxurious new décor and a new collection of spectacular production shows for the Constellation Theatre. The ship underwent an extensive, 25-day upgrade as part of Regent Seven Seas Cruises’ $125 million fleet-wide upgrade programme, and is now underway on a 23-night Barcelona to Dubai voyage that departed on 9 November. The ship now boasts the same elegant style and indisputable attention to detail famously featured on Seven Seas Explorer, providing all Regent Seven Seas Cruises ships with a consistent look-and-feel. Seven Seas Voyager joins Seven Seas Navigator as the second ship to receive this stylish new update to the public spaces and suites onboard. In addition to the elegant new décor, the ship will debut five new production shows in the Constellation Theatre. Compass Rose: The ship’s flagship restaurant received a new look with grand crystal chandeliers, rich wooden accents and celestial blue furnishings. The restaurant features a completely new menu. 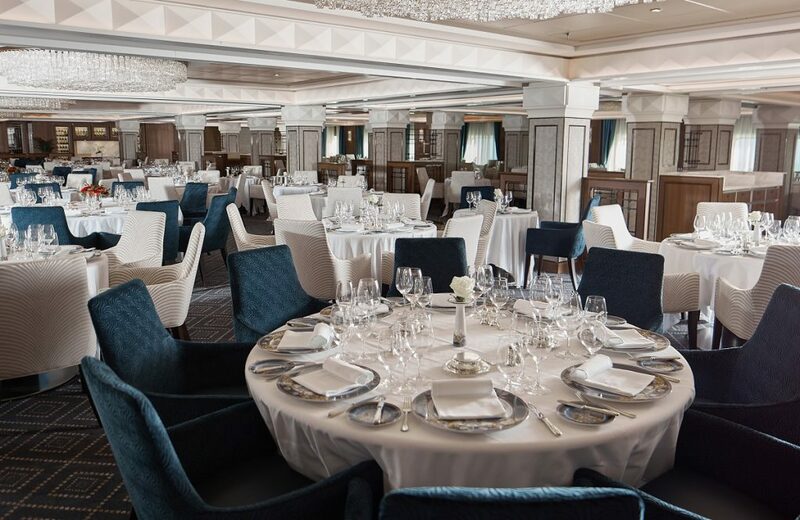 Chartreuse: The restaurant features new furnishings, china, flooring and décor elements inspired by the Chartreuse on Seven Seas Explorer, along with a completely new menu. La Veranda: La Veranda will feature a fresh and airy design with light grey coloured flooring and accent walls which accentuate the natural light coming from the restaurant’s floor-to-ceiling windows. In a major structural change, the buffet is now open to both sides of the restaurant and features a new cook-to-order grill station. Pool Grill: The outdoor eating area offers a new infrared barbeque grill, so chefs can prepare barbeque specialties such as steaks, chops, lamb and salmon on the open deck. Voyager Lounge: The marquee lounge features a new design that was inspired by a modern interpretation of a French cabaret. 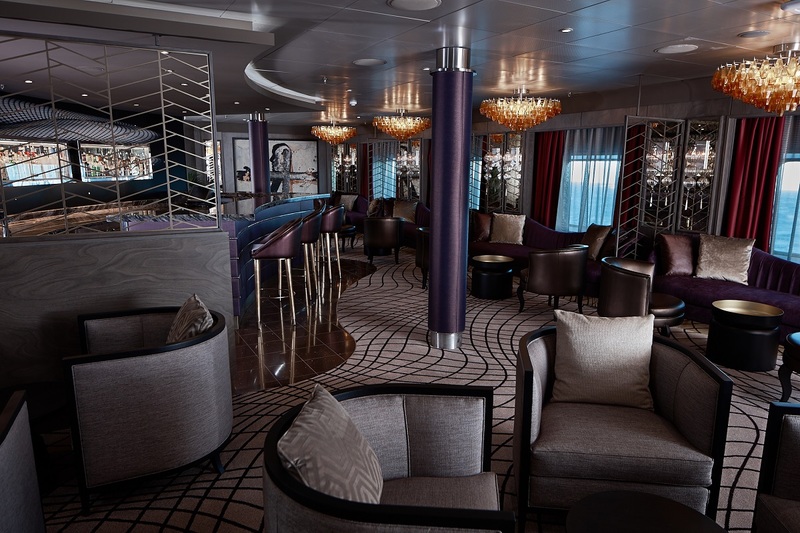 Areas also touched during the refurbishment of Seven Seas Voyager include the Reception Area, Coffee Connection, Connoisseur Lounge, Card Room, boutiques, casino and the Canyon Ranch SpaClub. In addition to the physical enhancements, the ship comes out of dry dock with five new astonishing production shows. Tuxedo: Highlighted by a live orchestra, Tuxedo presents a fresh take on the music of the Rat Pack, Tony Bennett, Natalie Cole and Frank Sinatra while also showcasing dynamic arrangements of classic songs by contemporary artists like Michael Bublé, Christina Aguilera, Brian Setzer and Harry Connick Jr. Lights, Camera, Music! : This tribute to Hollywood musicals showcases cinematic classics songs from the past three-quarters of a century. Broadway in Concert: The cast of Seven Seas Voyager will take guests on a journey through Broadway past and present with songs from Guys and Dolls, Annie Get Your Gun, Cabaret,Les Miserable and many more. Vegas! The Show: This show recreates some of the greatest moments in the history of Sin City, and the exciting entertainers who have made Vegas one of the entertainment capitals of the world. Guests will enjoy music from The Rat Pack, Elvis, Sonny and Cher, and Tina Turner. Dancin’ Fool: An evening of music and dance led by the Seven Seas Voyager cast that ranges from jive, salsa, quick step, disco and Broadway-style Fosse.